Heat oven to 350°F (325°F for dark or nonstick pans). Line two 8-inch square pans with foil, letting foil hang 2 inches over 2 opposite sides of pans. Grease or spray bottoms and sides of foil. Make cake batter as directed on box. Pour into pans. Bake 25 to 32 minutes or until toothpick inserted in center of cake comes out clean. Cool 15 minutes. In small bowl, mix powdered sugar and lemon juice. Poke top of warm cake every 1/2 inch with long-tined fork, wiping fork occasionally to reduce sticking. 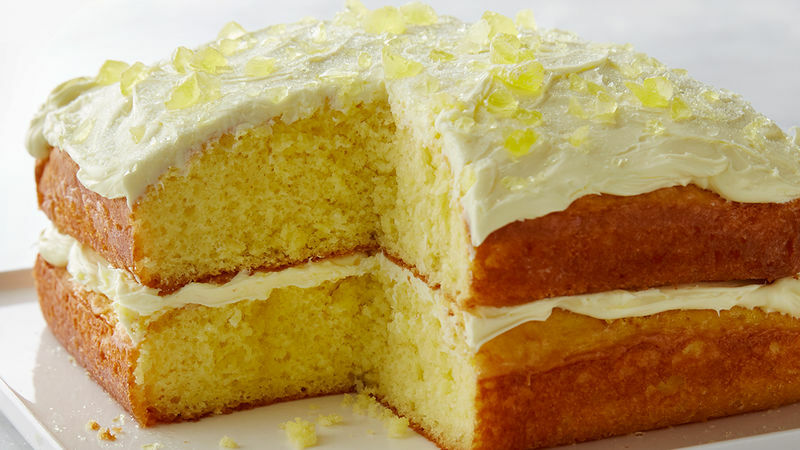 Drizzle and spread lemon mixture over top of cake. Refrigerate about 2 hours or until chilled. Remove cakes from pans by lifting with foil; peel away foil. In small microwavable bowl, microwave frosting uncovered on High 15 seconds. On serving plate, place 1 cake, rounded side down; trim if necessary so layer rests flat. Spread with half of frosting. Top with second cake, rounded side up. Frost top of cake with remaining frosting. Garnish with lemon drop candies. Store loosely covered. You can use two 8- or 9-inch round cake pans instead of the square pans. To crush lemon drops, place in heavy-duty resealable food-storage plastic bag and crush with rolling pin or meat mallet. You may have noticed the Meyer lemon popping up in recipes lately – but just what differentiates this mysterious citrus fruit from ordinary varieties? Know what happens when you cross-breed a lemon and a mandarin orange? You end up with a sweet, tart, juicy, fruity, aromatic Meyer lemon! So, just how did this delicious offspring come to be? It's an interesting story, actually. The Meyer lemon is thought to have originated in China, and was brought to the U.S. in the early 1900s by Frank Meyer, an agricultural explorer. While tasty, the fruit's skin is mighty thin, making it difficult to transport and hindering its distribution across the country. That is, until the likes of famous cooks like Alice Waters and Martha Stewart began touting its fruity goodness and including Meyer lemons in their recipes. Now, many adventurous cooks use Meyer lemons in an array of dishes, from lemonade to roasts. You can even serve up a Meyer Limoncello cocktail if you're in need of a springtime sipper. Or replace plain old lemon juice with squeezings from the Meyer lemon in recipes like this sweet Lemon Drop Cake or these So-Easy Lemon Bars.